Terran Times - ZineWiki - the history and culture of zines, independent media and the small press. 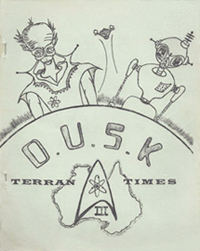 Terran Times was a media science fiction fanzine published by Shayne McCormack. Terran Times was published in Bass Hill, New South Wales, Australia, and was devoted to the original Star Trek television series and the subsequent movies. It is acknowledged to be the first fanzine devoted to Star Trek published in Australia. The fanzine was published from December 1969 to July 1972, with five issues being produced in that time. The first issue was published by Shayne McCormack and Sabina Heggie. "D.U.S.K." stood for "Down Under Space Kooks", a group mobilized to protest the cancellation of Star Trek in 1969. A special issue, published in 1980, celebrated the arrival of Star Trek: The Motion Picture in Australia. Contributors of art work included Evelyn Turner. Contributors of writing included Susan Smith-Clarke (Girl’s Own Fanzine). Terran Times featured articles, reviews, art work, poetry, and fan fiction and, aside from Star Trek, also covered some mainstream science fiction. It was also distributed by the Australian and New Zealand Amateur Publishing Association (ANZAPA). Shayne McCormack also published the fanzines So You Say, and Something Else, and collaborated with Ron L. Clarke, editor of The Mentor, Ark and Cold Cuts, on the title Wombat.